eTech is delighted to announce that we have won the West Midlands Newcomer SME of the Year 2016 Award for the second year running. Now in its 13th year, the National Apprenticeship Awards recognise excellence in businesses that grow their own talent through apprenticeships and the apprentices who have made a significant contribution to their workplaces. 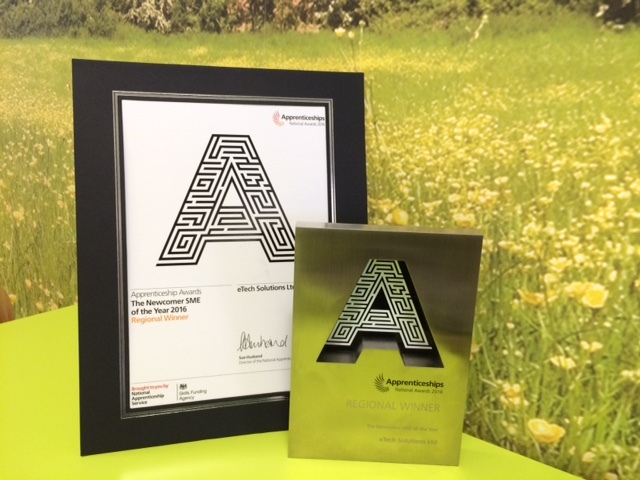 Rebecca Abbott, HR Manager commented, “ We’ve spent the last 12 months developing and enhancing our apprenticeship programme, and we’re delighted to have won this award again. Our apprentices play a key part in our new talent strategy, which aims to recruit only the best entry level colleagues into the business, providing a clear progression route for future leaders. We’re passionate about learning and development, and our apprenticeship programme demonstrates our commitment to helping colleagues progress within the organisation, learning on the job and maximising opportunities to get involved in different areas of the business.